The following is a final letter from Aileen, 20, of CFCA’s Legazpi. Philippines, project. She was sponsored through Walk with the Poor by the Justice League at Rockhurst High School in Kansas City, Mo. 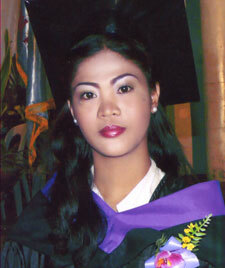 Aileen graduated in March 2009 with a bachelor’s in office administration. Warm greetings to all of you! I hope that you are happy upon handling this letter of mine. CFCA is such a big help to me and to my family. Iíve been in this foundation for 12 years. Being one of the CFCA beneficiaries is a very big blessing to us. Everything that I need is supported and assisted by CFCA, from the food assistance, medical and dental check-up, educational supplies, clothing, recreational activities, spiritual support and tuition fees. All of these benefits greatly helped us in coping with our needs in life. I’m very thankful to God because I belong to this foundation, and I have sponsors like you who are willing to help us without expecting in return. I can say that I’m blessed to be sponsored by you. Thank you so much. You know, I’m sad to say that I have to waive your sponsorship for me. I graduated from college through the help of CFCA, last March 26, 2009, with the degree of bachelor of science in office administration. Because of CFCA, I was given an opportunity to finish my studies. My father is a single parent and he cannot afford to send me to college. Thatís why Iím so grateful and thankful to you and to CFCA. I think I won’t able to reach this far without your generous support. Thank you very much!! Right now, I am clearing all the requirements for me to have the transcript of records. I always pray to God that I could find a good job because I really want to help my family to uplift from poverty. CFCA and you, dearest sponsors, are part of my life. You played a very big role in achieving my dreams. You will be forever in my thoughts and prayers. My whole family wants to express our regards and sincerest gratitude and thanks to all of you there. You changed and touched our lives. We pray that God will shower you more blessings, and we also wish the success of CFCA. Thank you very much!!! God bless you all!! congratulations ailen..yes CFCA is the best i wish you luck for your chosen career..
Congratulations Aileen. Hope your wish to get a good job soon be granted. The human and spiritual formation which CFCA has accorded you will now bear fruit in what ever and wherever work you will be. Carry on. Beautiful letter! Beautiful young lady! It’s nice to hear how much those fundations help people. I hope she does well for herself.